How to Layer Window Treatments? Let us show how. There are so many choices when it comes to window treatments—light sheers, heavy drapes, shades, blinds, valances, window scarves. The best part is you don’t have to pick just one! Layering window treatments adds interest and personality to any space. One of the easiest—and most practical—layering treatments is drapes over sheers. Simply use a double curtain track to layer a set of sheer curtains behind a set of heavier curtains. Airy sheers allow lots of natural light to flow into the space, while thicker curtains offer maximum privacy and often lend a jolt of pattern and color. Pelmets are decorative with pieces of fabric on top of wood, or metal that sit above the window treatment. They can be tailored depending on your style. Tip! Curtains don’t have to match the Pelmets, but should coordinate for a cohesive look. If your curtains are patterned, pull a color from the pattern and use it on the Pelmets. Hanging curtains and shades with blinds on a window adds pizzazz and eye-catching depth. 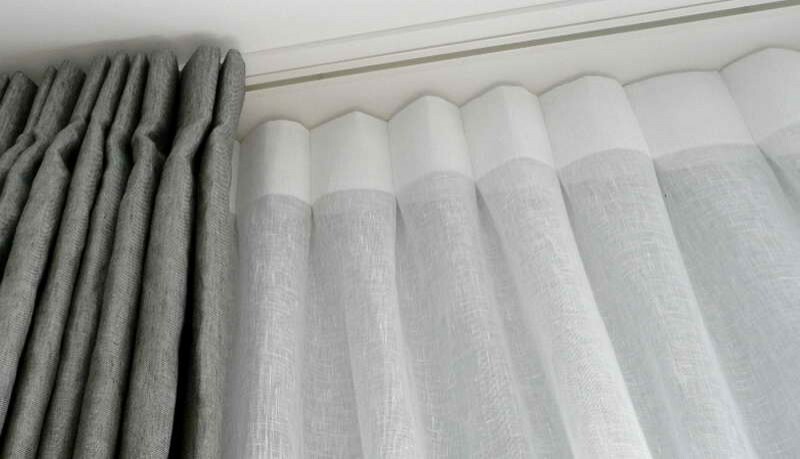 Layering curtains over blinds has the dynamic effect with a textural look and also a softer feel. Tip! Hang curtains higher than the window frame, closer to the ceiling, to create the illusion of taller windows.